Home improvement is hard work. J and I are starting the process of renovating our bathroom. No, we’re not doing it, but we’re buying all of the materials for it. After a long weekend in Chicago, we both had Monday off and we needed to pick out tile. Our contractor likes to work with Home Depot, so we headed there first to look at floor tile. We found what J was looking for and got it all loaded up in to her car. We still needed to check out Lowes for the wall tile. She couldn’t find what she wanted at Home Depot. It was about lunch time and I was really hungry. I asked if she would want to eat before we continued on with our journey. 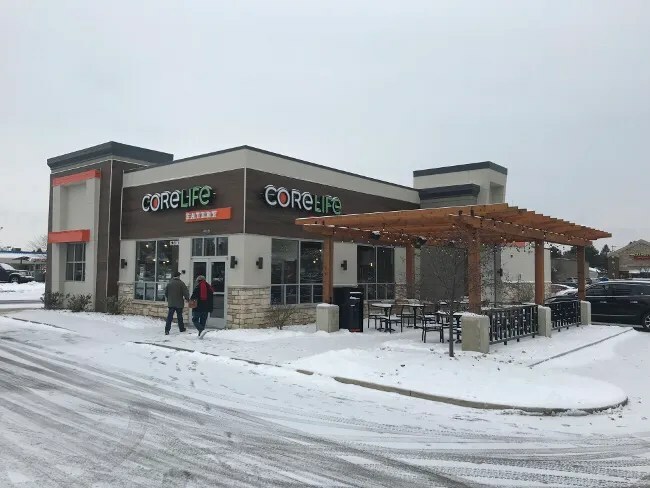 I’ve been wanting to get to the new Core Life Eatery in Portage. 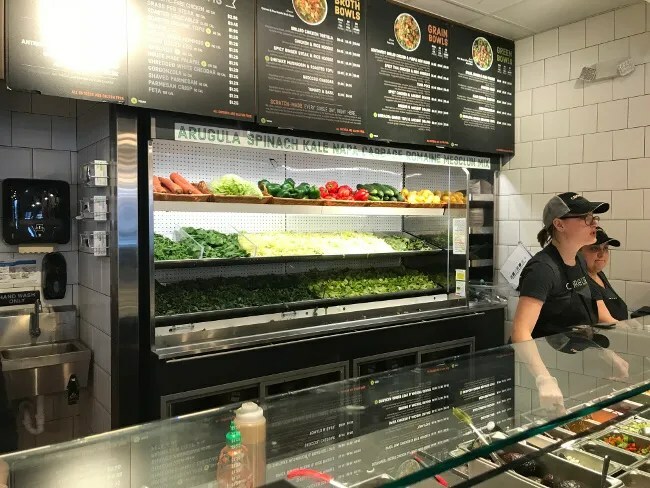 The new restaurant chain which promotes itself as clean, healthy living is on South Westnedge just north of Mall Drive in the Southland Shopping Center. It’s in the spot where Pizza Hut once stood at the front of shopping center near Westnedge Avenue. The building has undergone an extensive renovation and added a patio just off the north side of the building. The restaurant is set up like a typical sandwich shop but CoreLife isn’t typical. There are no sandwiches. The menu consists of Greens Bowls, Grain Bowls, and Broth Bowls. There is a large rack of fresh greens behind the counter. When you order, the first person on the assembly line grabs and bowl and fills it with the salad you chose. 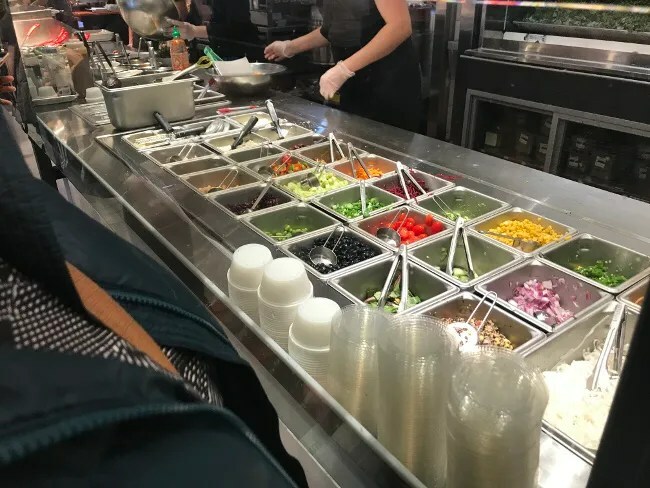 The toppings are laid out in front of you and are added by the next employee in the assembly line. 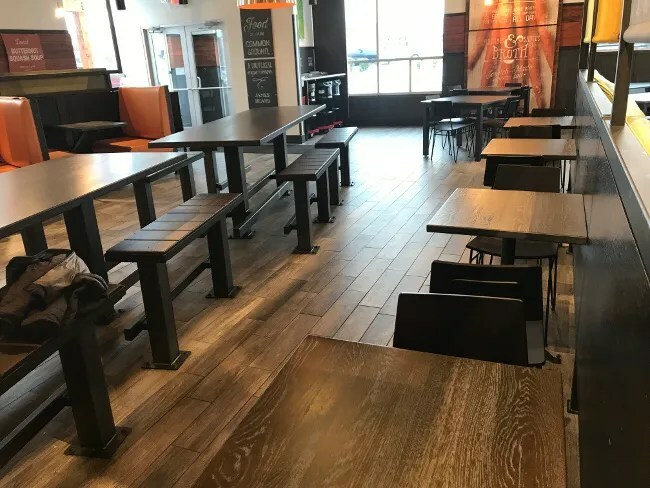 It’s very similar to the set up of places like Blaze Pizza or Moe’s Southwest Grill. You can order one of their combinations or you can build your own. Either way, you can decide what you want or don’t want in your bowl. The last part of the assembly line process is the dressings. The options are all lighter choices. 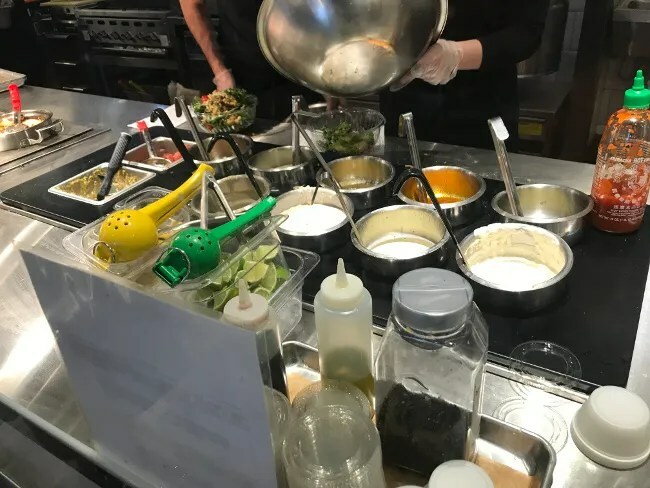 You want find a ranch or an Italian dressing but there is a large selection and they recommend a dressing for the salads that they put together. We decided to grab our meals to go because there really wasn’t anything for the toddler to eat. I got the Steak, Bacon, and Bleu Cheese Greens bowl while J ordered the Greens and Ancient Grains Greens Bowl. We added on two drinks which brought the total to just under $25. 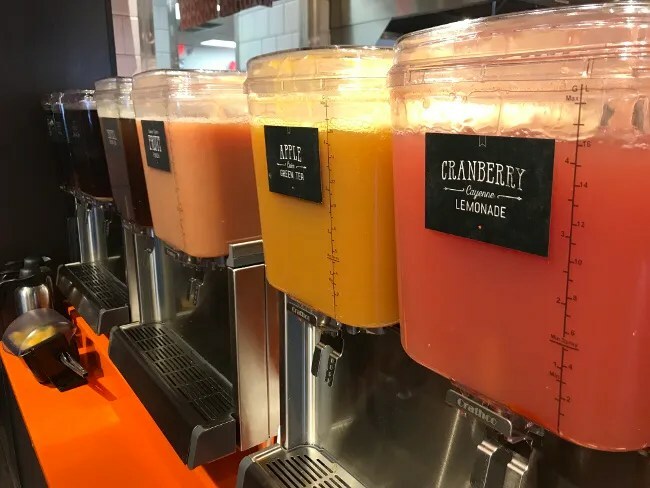 The drinks are another one of the cool features of CoreLife. They don’t have pop so no Coke or Pepsi. They have a number of fresh lemonades and teas. J got a Cranberry Cayenne Lemonade while I stuck with a plain ol’ boring lemonade. Good thing I did that though as B really, really wanted my drink. I only got a few sips before he commandeered it for himself. Quick note on the dining area since we didn’t actually dine in. There are two dining spaces. The first one is is in the same space as the order area. It has some larger picnic type tables and the smaller two tops along the wall. The whole area goes for the brighter, outdoor feel with hardwood floors and rich, wood grained furniture. There are a couple of booths which are covered in orange leather which seems to be the primary accent color in the restaurant. The second area feels a little more intimate with more booth seating and more two tops. The wood theme is carried throughout the restaurant but some yellowish-green is added to the cushions to give the space a little more color. We grabbed our drinks and headed home to eat. The first thing we both noticed is the bowls are quite large. We both had trouble finishing and we both felt satisfied as we cleaned up to get ready to go back out to do some shopping. As I mentioned earlier, I ordered the Steak, Bacon, and Bleu Greens Bowl. The salad mix is romaine and mesclun greens. 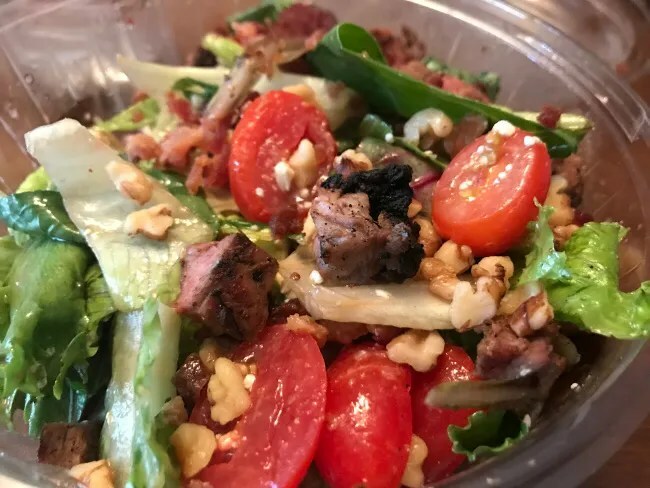 It’s topped with grass-fed steak, cranberries, walnuts, tomatoes, and bleu cheese. The suggested dressing is their Cranberry Vinaigrette, but I opted for a basic balsamic vinaigrette instead. I was a little surprised by the amount of meat on this salad. There were big chunks of steak and small, crispy bits of bacon. The tomatoes are cherry tomatoes that have been sliced in half. I didn’t think they put very much dressing on as I was watching them make it, but I got that sweet taste of balsamic and oil in pretty much every bite. I could have used more cheese but that’s about the only slightly bad thing I could say about this salad. J picked the Greens and Ancient Grains Grain Bowl. 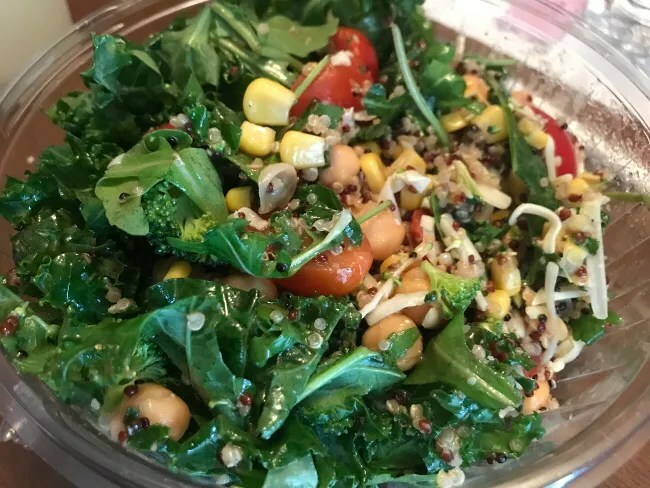 The bowl works just like a salad with shredded kale and arugula but it also adds warm quinoa to the mix. The bowl is topped with tomatoes, corn, chickpeas, broccoli, and white cheddar cheese. J is much more of a salad eater than I am so I expected her to like CoreLife and, sure enough, I was right. She really liked the bowl and told me it was probably a good thing the restaurant is in Portage and not on the West side of town. When CoreLife Eatery opened they tried a couple of times to get me in for a free meal during one of their preview events. I always turn those down because I don’t want to feel like I owe anyone anything. A lot of food bloggers will take places up on the free meal and the restaurant ends up with some (mostly) free good publicity. I’ve always said I’m not a food critic. I just like to eat. 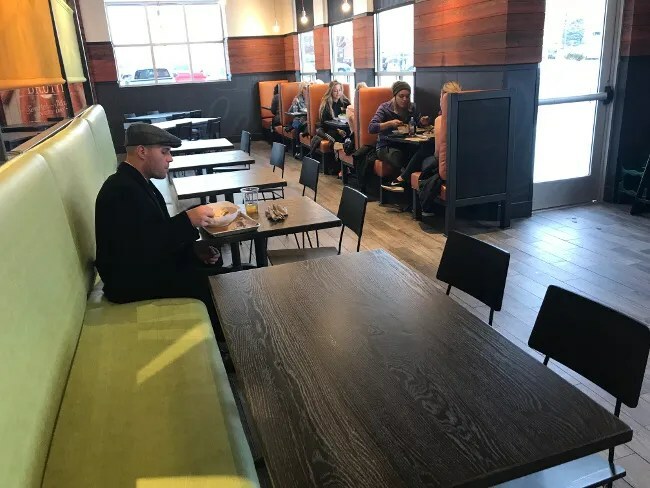 I don’t write very many *bad* reviews and I can tell you, only once I have accepted a meal (Smashburger…same kind of pre-opening preview for social media users). I didn’t feel good about that after the fact although I was completely honest in my blog. I enjoyed…and still enjoy Smashburger. 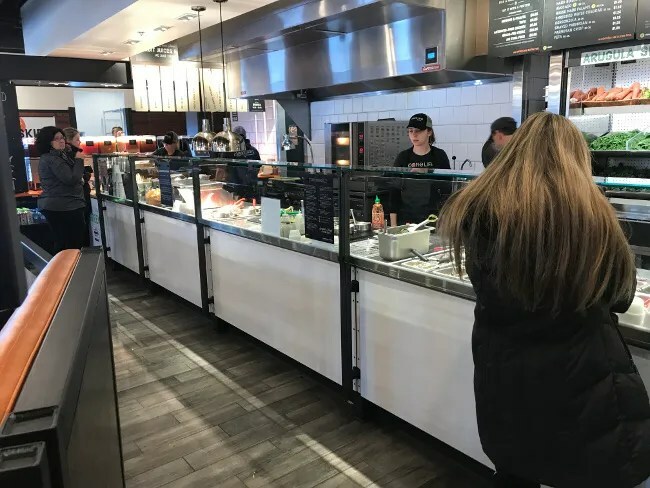 CoreLife Eatery is another one of those new places that bring something completely new and unique to the market. The days of only have greasy burgers for fast food options is quickly coming to an end. 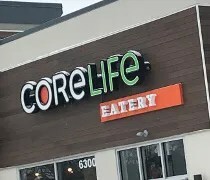 Places like CoreLife provide that alternative to people who don’t want a burger or don’t want chicken but still want a delicious, quick meal.